I just got that dreaded email. I almost can’t believe it. I have been waiting to hear back from this company for what seems like forever. Two months ago I took the day off from work to interview with seven different people there. It was grueling. And they had the nerve to send me a form rejection letter over email? Hey there, recruiter. Yes, I’m talking to you. You’re not paying enough attention to the candidate experience. Whether or not I get the job, I’m going to tell my friends and colleagues about you. If you treat me with respect and manage the process well, I’ll be your advocate. If you don’t, well, I might rant on social media. But regardless, a good experience can be the difference between winning me and driving me away. Don’t underestimate your role in ensuring that I have a good interaction with your company. Follow some of these tips* and you’ll be well on your way. 1. Give me an alternative to applying for a job. Sometimes I don’t want to apply for a job right away, and sometimes I don’t see the right job when I visit your careers site. Give me a way to stay in touch for the future. 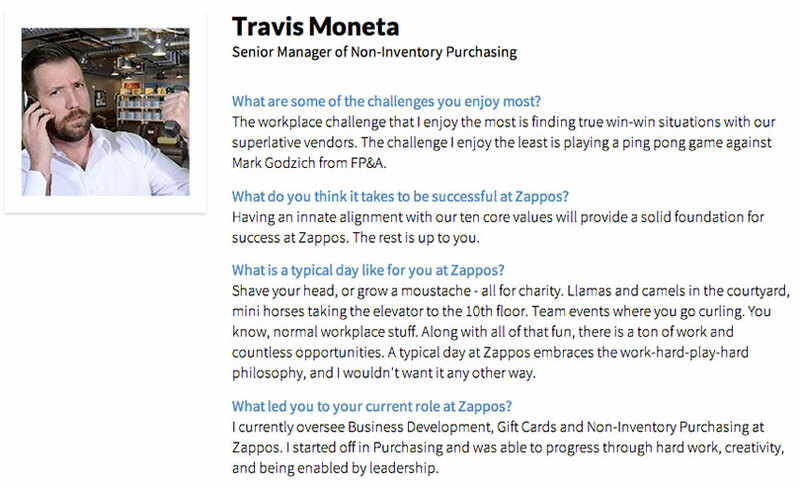 Through its Insiders program, Zappos invites candidates to stay connected without being tied to a certain job. Similarly, SAP has set up a talent community that allows candidates to connect with the company, keep up to date on the latest news, and receive customized job alerts. 2. Show me how to complete the application with a video. Sometimes the application can’t be short and sweet for regulatory or other reasons, so there are more screens and steps than I’d like. In that case, include a how-to video that shows me how to complete the application. It’ll help set my expectations for how long it will take and make it seem more doable. 3. Put your process everywhere. I want to know what the application process is from start to finish and what I can expect at each stage, so show me. One company I applied to had a detailed flow chart on its website; another mapped out the process on the interview room wall. The more transparent you can be, the better. 4. Introduce me to employees on your careers website. 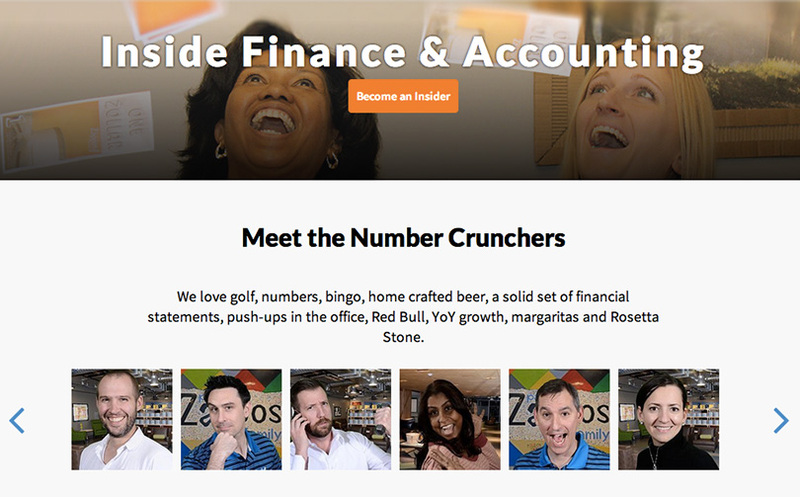 Before my interview with the Zappos finance team, I was able to click on the people slider and learn more about the team members. It was a great supplement to their LinkedIn profiles, helping me build rapport with my interviewers and learn more about the company culture. 5. Brand your emails, especially the automated ones. Those generic auto-responses? Ick.Sure, they are better than no response at all, but brand yours so that they make me feel like a person, not a number. The best ones include information, such as links to blogs, videos and upcoming events. Let me put it this way: I’ve never been contacted too much by a recruiter after applying for a job. One recruiter I know really nails it. She sets aside every Friday afternoon to reach out to me and everyone else in her pipeline to give us updates about where we stand. Even if the news is no news, I know that I’ll always go into the weekend having heard from her. It’s a great feeling. 7. Put the onus on me to check in. Sometimes you’re too busy to follow up because you’re trying to fill 30 reqs at a time. In that case, put me in the driver’s seat and tell me to call or text you if I haven’t heard from you by x time. When I do call, you can tell me that I am still on your radar and that you will get back to me. Giving me a sense of control will make me feel better about the process and your company. 8. Stage the onsite interview process. Dedicate someone to greeting me and making sure I get enough breaks. Snacks are a huge plus, as is a tour of the office. Having one point person for the day of interviews goes a long way in making the experience a warm and pleasant one. Give me an iPad with links to the LinkedIn profiles of my interviewers, my travel information, and anything else I might need throughout the day. For more ideas on how to stage the onsite interview process, check out how LinkedIn delights its candidates. Know me cold. Know what is important to me, my aspirations, and why I am interviewing. Communicate this to the hiring team so that they can share relevant personal experiences and tailor the conversations to me, rather than conducting a cookie-cutter interview. Also, make sure I don’t have to answer the same questions over and over again. A little question overlap is fine, but total redundancy is so draining. Assign roles to the interviewers and map out who is going to ask what. 10. Ask this question every single time. Even if I don’t get the job, this question lets me walk away feeling more satisfied because I know I gave it my all. There’s nothing worse than feeling like I didn’t get to put my best foot forward. 11. Give me negative feedback. I once got feedback that stung so badly, but it truly helped transform me for the better. I had never had a recruiter do that before and it was so refreshing. If you delicately tell me where I fell short, I can go out and get more training and experience and reapply. If you don’t give me that specific feedback, I probably won’t ever come back. Remember, the majority of people you interview won’t get the job, and that could translate into hundreds or thousands of people a year. How you reject us will have a profound impact on your brand. 12. Ask for my feedback. Survey me about my experience, whether or not I got the job. Make sure you share the feedback with hiring managers and leadership, and tweak your process based on the findings. 13. Do not email-reject me after I came in for interviews. If I took the time out of my busy day to interview in person, I deserve a phone call if you are going to reject me. It’s that simple. 14. Close me out, even if I didn’t interview. I am just as interested in the job as the person who was granted an interview, so please, let me know when the job is filled.Send me a bulk message through your ATS, fine, but just give me closure and thank me for my interest and time. 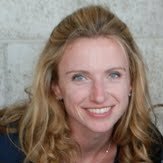 One recruiter blew me away when she offered to stay in touch and even help me network with recruiters at other companies. What a great way to pay it forward. I’ll never forget her or her company, and will happily send her referrals. 15. Get everyone involved in closing me. A company once courted me for three years. When the right position finally came around, the entire extended team got involved talking with me. I was happily employed elsewhere, but having about 20 different people reach out to offer their perspectives was really what got me over the edge. And then when I started, a similar thing happened: people who weren’t even on my team reached out to say welcome. It really made me feel special. 16. Tie your performance to my experience. To really make a dent in improving your candidate experience, hold yourself and your fellow recruiters accountable. At LinkedIn, recruiters’ objectives and key results are now tied directly to the candidate experience. Once the company made the change, recruiter satisfaction ratings went up 5%, coordinator and interview scheduling ratings went up 13%, and the interview ratings themselves lifted 23%. For even more candidate experience tips, see how Airbnb, Rapid7, and LinkedIn are shaking things up. And if you have a candidate experience tip to share, let us know @hireonlinkedin. *At Talent Connect San Francisco last month, five talent acquisition leaders from around the globe came together to talk candidate experience best practices. This piece is based on their ideas. Special thanks to Stacy Donovan Zapar, Candidate Experience and Engagement Strategist, Zappos, Mark Alfaro, Senior Product Recruiter, LinkedIn, Anil Gidh, Vice President & Head - Talent Acquisition & Resourcing, Capgemini, Matthew Jeffery, Head of Global Talent Acquisition Strategy & Innovation, SAP, and Kristina Shedd, Director, Global Hiring, Sapient. Check out the full video here.